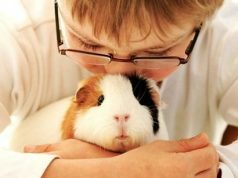 Home Small Pets Guinea Pigs Guinea Pig Feeding Guide – Which Foods Are Best? And no, we don’t mean ‘Pets at Home’, but rather, where they come from originally…which is the Andes in South America. This is one of the world’s longest mountain ranges, a rocky environment consisting of rocky slopes, grassland, woods, and forests. What has this to do with feeding your guinea pig? By understanding what guinea pigs eat in the wild, it unlocks what to give your pet pig for a healthy diet. For starters, guinea pigs are vegetarian, living off plant material. Indeed, the majority of a feral guinea pig’s diet is made up of grass, dried grass, or herbage. The guinea pig’s gut has adapted to harvest maximum nutrition out of this low calorie food and it’s what they do best on. Too much rich food has the opposite effect and leads to problems such as obesity and poor teeth. 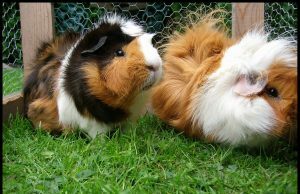 The perfect food for guinea pigs is grass: Not pellets, not muesli mix, not fruit, not treats…but good old grow-in-the-ground-grass as it contains the perfect balance of calcium and fiber for strong bones and healthy teeth. OK, so it’s not possible to have 24/7, 356 access to growing grass so what can you feed instead? The answer is good quality hay, preferably hay with a green tinge that smells sweet when you open the bag. To make things clearer, here is our five point plan for feeding a guinea pig. Give your guinea pig ad lib access to fresh, green hay and you’ll have a healthy guinea pig. Provide a hay net or rack to keep it up off the floor and your pig can graze to his heart’s content without growing fat. Grass takes a lot of chewing, which keeps teeth worn down and prevents them overgrowing. Unfortunately, if a guinea pig isn’t used to eating hay (because he eats pellets) then overgrown teeth may make it painful to chew. If you suspect this to be the case then offer him hay chopped up with scissors, to help build those good habits. Think about feral guinea pigs in the Andes and you’ll realize they don’t eat much fruit. Reflect this in the amount you feed a guinea pig. Fresh fruit is fine, but in moderation, such as a piece of apple as an occasional healthy treat. Remember it’s not part of their natural diet and you won’t go far wrong, but feed too much fruit, and the moisture and sugars will cause diarrhea. No other aspect of feeding guinea pigs is more misunderstood than offering pellets. Pellets should only be a small part of a guinea pigs diet. This is because they are high calorie and don’t require much chewing. Therefore the end result of a pellet-rich diet is an overweight pig with overgrown teeth. Not great. Also, not all pellets are created equal. Avoid muesli mixes, where you can identify and pick out individual peas, corn, and kibble. Instead, opt for an ‘extruded’ mix, where each pellet is identical. The latter type of pellet avoids selective eating. Selective eating is the equivalent of us grazing a buffet table and loading our plate with cakes and pastries, whilst avoiding the brown bread and porridge. Unfortunately, those less tasty options are also the healthy parts of the diet. It’s just the same for guinea pigs and muesli mix. They tend to eat the guinea pig equivalent of candy and leave the wholesome nutritious bits. In the long term this leads to dietary deficiencies. As to how many pellets to offer, vets recommend each day giving no more than the guinea pig can eat in 20 minutes or about an 1/8th of a cup. Also, make sure the food is supplemented with vitamin C and keep the pack sealed between servings to preserve the vitamin content. Your guinea pig needs a constant supply of clean, fresh water. A sipper bottle is the best idea as it’s less likely to get knocked over or dirty. If you have several guinea pigs then have more than one drinker, to avoid bullying over resources. And finally, if your guinea pig is a pellet addict, take care to change his eating habits slowly. He may well struggle to eat a high fiber diet, especially if his teeth are overgrown or painful. Try chopping up hay and offering it alongside his pellets, to entice him to chew. Most important of all, if your guinea pig stops eating, see the vet immediately. Without a constant through put of food, the guinea pig gut readily goes to sleep…with potentially serious consequences if it isn’t ‘woken’ promptly. But the best news is, when you feed the right foods, your guinea pig is likely to keep chomping and chewing for many years to come. If your knowledge of guinea pigs is hazy and this unfamiliarity makes you hesitate, then fear not. Here is everything you need know about this fascinating, friendly species. Should I Get A Male Or Female Ferret?